Monday was a difficult day. Overwhelmed by the events of last Friday in Sandy Hook, I struggled to write a blog post about the project I’m working on for Northwest Arkansas Community College. It was the heartbreaking photograph I saw of twenty-six paper angels atop a hillside that drove me outside for a walk. The Northern California coast, where I am visiting for a few weeks, was at its winter best, the sky heavy with grey clouds, hillsides velvet green and the damp muddiness that comes from weeks of intermittent rain. Feeling disconnected and out of sorts, I decided to make this a “windfall walk”. I learned about windfall walks a couple of years ago from the textile artist, India Flint at a Surface Design Association conference. India, a natural dyer, walks, somewhat aimlessly, looking for plant material that has fallen to the ground and collects it for use in her work. While India’s work and mine are very, very different—she uses what she gathers to dye the cloth, I use what I find to make marks on and inform my work—thinking of this walking and gathering as an event is very useful to me. Often I think of windfall in the larger sense: what can I gather from what the world presents to me today? Sometimes I collect only photographs, or my thoughts. Lining the trail is a stand of eucalyptus trees. California and the eucalyptus tree have a rather unhappy history. Imported from Australia in the 1850’s they were supposed to be a quick growing supply of wood for construction and railroad ties. Unfortunately, it turned out that the young growth of the tree was unsuitable to any use other than a wind block, but by the time that was discovered many trees had already been planted. 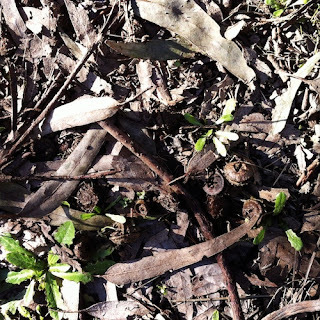 In the San Francisco Bay Area they are an ubiquitous part of the landscape. 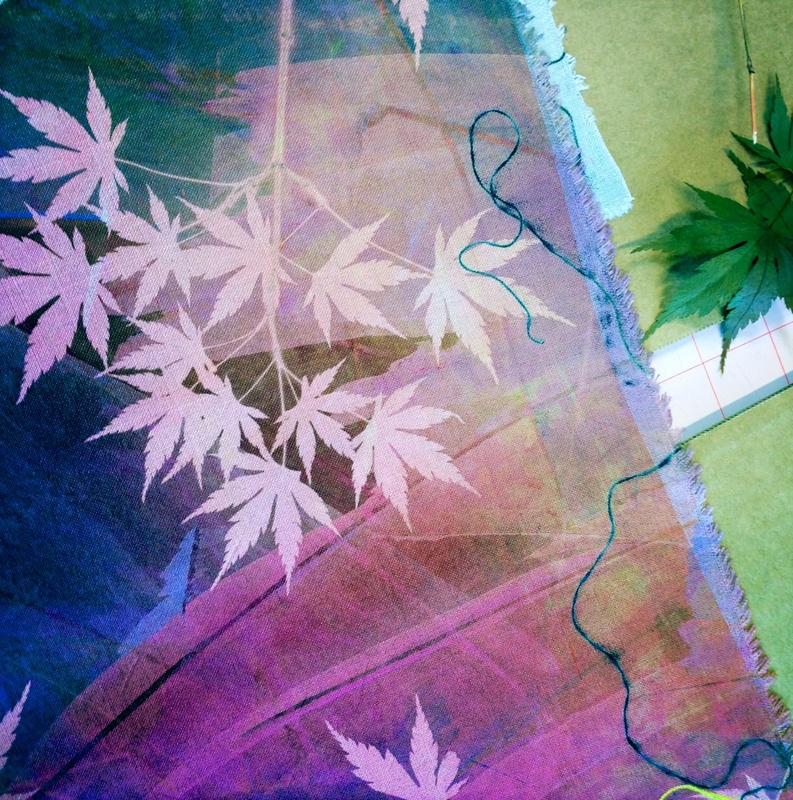 Eucalyptus may not have lived up to its potential in industry, and I’ve read that some ecologists think of them as invasive pests, but they do have at least one redeeming quality if you are a textile artist: the leaves make an excellent natural dye. As I walked along the path thinking about Eucalyptus trees and unfulfilled potential, I noticed at my feet little round shapes with x’s in them. 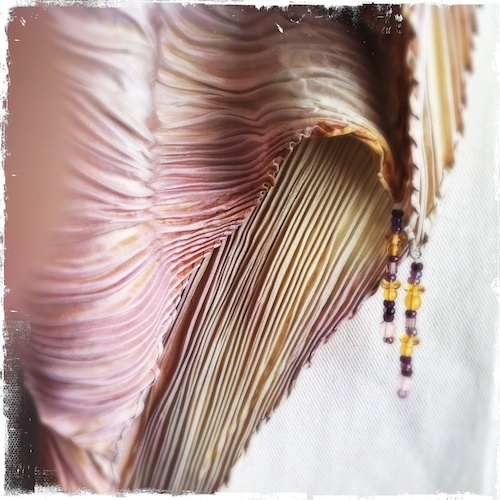 Eucalyptus seed pods…hmm…perhaps two redeeming qualities…like a good windfall walker, I gathered some up and took them into the studio with me. I have the good fortune to work with my friend Dotti Day in her studio while I’m here. 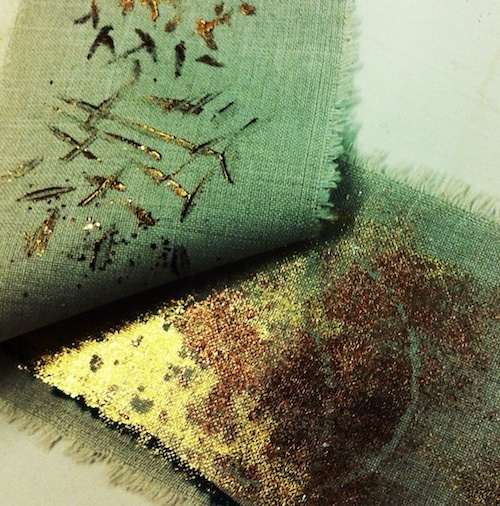 Dotti works primarily in silk and creates whole cloth art pieces. She is also quite knowledgeable about shibori, here, let me distract you with a detail of one of her gorgeous Arashi shibori scarves. This past week Dotti has been teaching me about foil application techniques and graciously allowing me access to her vast stash of tools and supplies. First she showed me how to apply special glue made to work with the foil sheets. That worked fine. 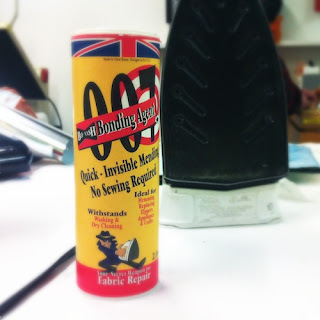 Then she brought out the secret weapon 007 glue powder. That was pretty fun. Next we talked about the method of using a Thermofax screen to apply the glue. “It’s easy enough to make a screen,” she said, “you just need to have an image, in black and white, of what you want to print.” Sounds simple enough. 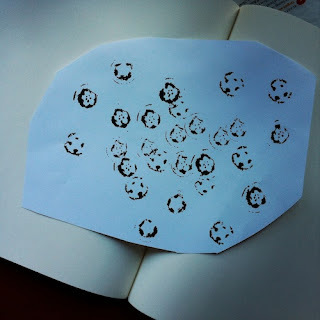 To create my image I washed and dried the Eucalyptus seed pods I’d gathered, cut a small piece of felt, dropped some black ink onto it to create a stamp pad and printed a variety of the pod heads in a pleasing manner on a piece of paper. After it dried, I scanned the image into the computer, made the blacks blacker, the whites whiter, and printed it out on the laser printer. Dotti fired up her trusty old Thermofax machine and created a screen for me, then showed me how to mount it into a frame and tape it off. With the screen mounted it was time to print the glue onto fabric and iron on the foil. I choose for this experiment a piece of cloth I had in my stash and randomly printed my design a couple of times. 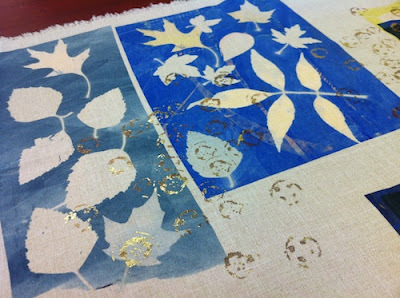 Then I applied a bronze foil over most of the design then went back and applied some gold foil to add depth. I am very pleased with the results and can see great potential for using this technique in my work. Dotti generously gave me some rolls of foil to take back to my studio so I can continue to experiment.